Happy Easter everyone! I hope you’ve all gotten sufficiently full on ham, chocolate, and the blood of Jesus. Before settling in for a late nap/early bed time here’s First Star, Worst Star rising from the dead like the Easter Bunny! Let’s take a look at what’s going on in Russia lately, shall we? – From what I’ve been able to gather this clip comes to us from what is essentially the Russian equivelent of the AHL. We pick things up in the second period of game 3 of a semi-final series between a team wearing white jerseys and a team wearing blue ones. – Things appear to be pretty chippy already, as games tend to be the further along you go in the playoffs. The coach of the blue team has an issue with something the ref did/did not do, and is VERY animatedly letting him know about it. For some reason the white team coaches join in on the frey (to also argue with the ref I’m assuming) and next thing you know we’ve broken into a full-on middle-aged-men-in-suits shoving match! – Here’s a new move I’ve never seen before: the “pinch the cheek as if you’re someone’s overly aggressive aunt” maneuver! – As these things normally go both teams end up getting involved in a lot of half-hearted pushing; what I like to call “Oilers Style Aggression”. – Because we’re in Russia a guy in a giant fur hat pops up from the pile, seemingly out of nowhere. I’m assuming this would be similar to if a Mountie appeared to break up that Roy/Boudreau glass pushing match from last year. – FIRST POWER MOVE: At around 1:45 one of the coaches rips a blue players helmet off and hurls it at him full force, all in smooth motion. 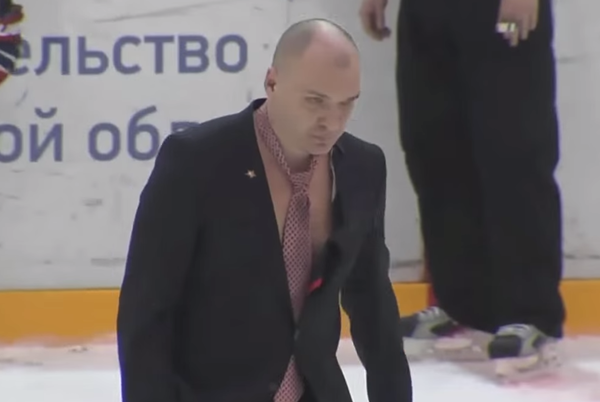 – SECOND POWER MOVE: We skip ahead about 6 seconds and for seemingly no reason at all coach Andrei Razin appears sans shirt! HOW DID WE GET HERE? Did he just find himself underneath a pile of players and decide to get prepared just in case things REALLY popped off? And to put a beautiful, vodka-filled cherry on top he gives the crowd a show! – Razin then goes on to hold court with the referees, still sans shirt! – And just to REALLY hammer the point home that he’s an unhinged crazy person, Razin gives the opposing bench the “Always watching you” gesture as he gathers up his clothes and makes his way back to bench, all the while with a maniacal smile on his face. 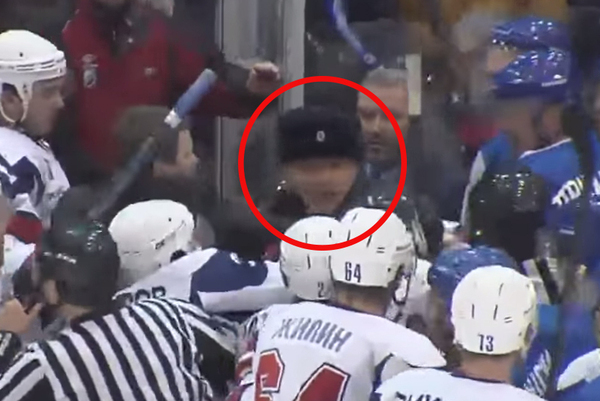 Pro-tip: DO NOT mess with Russian hockey coaches. I’m assuming this is what happens when the leader of your country seizes every opportunity to pose shirtless. The bar has been raised here gang. Your move coach Roy! Congrats to the United States Women’s National Team for defeating Team Canada in the gold medal game of the World Hockey Championships this weekend. Thankfully the US team has plenty of room for another World Championships trophy, as their mantles aren’t cluttered with silly Olympic gold medals or anything like that! I still have no idea what the hell is happening here. This is at both the most amazing shootout save, and worst shootout attempt I’ve ever seen. Err….. Well…. At least Joey Crabb got a shot off here I guess? Still though the goalie is literally staring at his skates the entire time and you STILL SOMEHOW HIT HIM SQAURE IN THE PADS?? The official story is that Manchester Monarchs goalie Patrik Bartosak couldn’t hear the whistle, and therefore had no idea Crabb was coming down to shoot on him. But I’m going to choose to believe that Bartosak did this on purpose, and it was the ultimate in psychological warfare. He got SO FAR into Crabb’s head that he panicked and wasted a golden opportunity where he literally could have just pushed the puck into the net from inches away. Luckily for Crabb his Hartford Wolfpack team ended up winning, so no real harm or foul. And Bartosak seems to be laughing the whole thing off too. But all parties involved should be throughly embarrassed. 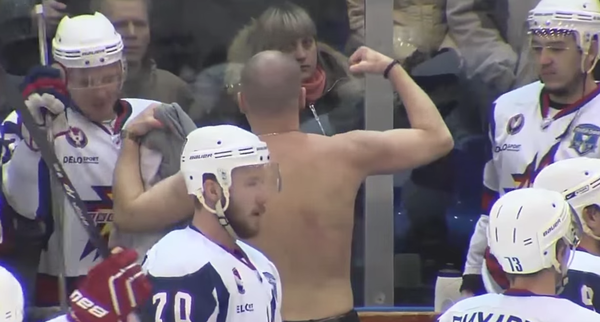 You’re never going to make an NHL team by pulling stunts like this. I mean, unless that team is the Sabres or the Coyotes or the Oilers or the Leafs or…. Whoah! Somehow ended up on Flames Nation. Excuse me, I have to take a shower or two. And now we have to scrub the place down with bleach. Ahhh. The dreaded double post. Trade proposal ..If Pittsbrgh wanted to move Malkin and defenseman Kris Letang since they arent winning anymore wold you consider shipping ot Taylor Hall and or 2015 first rounder for those 2 players?? It would give us that star center we lack and if health a really still young stud on defense. I’d do it for sure. At this point I feel like only Nuge is safe. How awesome would it be to have Pit miss the playoffs, make that trade, and then win the lotto with our Pit first rounder from The Perron deal. Then we can prove Kelly Hrudey right and put Nuge on the 3rd line where he belongs. No way does Pittsburg do that trade. Keep adding. Better throw in Omark, just to make it a deal that Pittsburgh can’t refuse. I doubt the Penguins would be smart enough to trade Malkin but they should and would be a better team if they traded Malkin and Letang for Hall and a 1st round pick. They still have a lot of star power and could improve their blue-line depth. The problem tho is that Malkin and Letang have modified NTC or NMC in their contracts. I doubt Malkin would allow a trade to Edmonton. The Penguins should try to trade him tho. Having Crosby & Malkin makes them too top heavy and the Pens have 2 top centerman they don’t need. Only one and Taylor Hall would be a much better player for the Pens than Malkin. He doesn’t play defense well enough and takes shifts and games off. Wait, what? Two top centermen they don’t need? Are you on glue? The Pens must be chomping at the bit to trade one of the top-5 centremen in the world, so they can get the Western Conference’s version of Phil Kessel. ESPECIALLY if they’re looking for more defence from their star players to help them win playoff games. Because if there’s two things that come to mind when you think Taylor Hall, it’s 1) defence, and 2) a proven playoff record. After all, Malkin only has three 100+ point seasons, and one measly Conn Smyth trophy for playoff MVP to go along with his Stanley Cup ring, his Hart, his Calder, two Art Ross trophies, and the Ted Lyndsay award for most outstanding player as voted on by the players. Taylor Hall won AHL player of the week once, during the lockout. That might just be the most unrealistic trade proposal I have ever read. Put down the pipe and slowly back away. 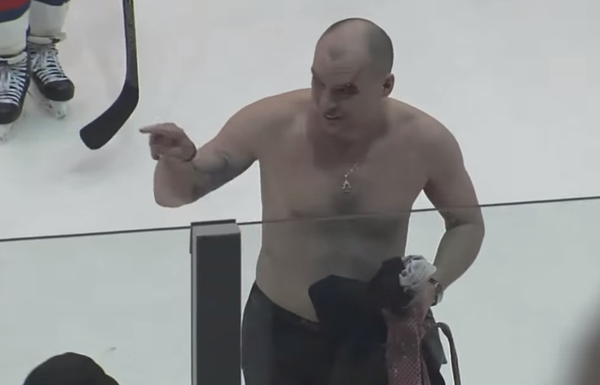 We should’ve hired that Russian coach to replace Eakins. At least then we’d be getting some entertainment. Instead of the AHL gong show of a team MacT’s provided. Hopefully Katz will grow a pair and do something about it but I highly doubted. Lmao! I have never meet a Russian that didn’t like to fly off the handle. That probably wasn’t even that weird of a moment over there. I think a side note star should go to the TSN analyst of the women’s WC match who waxed poetic on the “fact” that the reason the Canadians came back in the second and tied it was because their hearts were bigger. And then subsequently got fed their lunch in the third. She should now take a lesson from Bobby Mac ….. say all encompassing things when you are completely 250% sure you are correct. Otherwise. STFU. What was that comment about the woman not having Olympic Medels on their shelf? Was that a shot at the U.S. coming from a Canadian? Or does that have some side note or joke that went over my head? It really sounds to me like this was written by a Canadian because they hate to lose anything to the U.S. The thing they forget is without the U.S. their would be no NHL and their teams would get the revenue of an AHL team, if that. In any event I’m sure the last Olympic loss to Canada was on the minds of those girls. Most of the revenue comes from the Canadian teams and for many years has been the only thing keeping the league viable. With the Canuck buck down the salary cap won’t go up — that’s how little impact the U.S. Teams have on the league. I have to admit, that shootout save was probably the most hilarious thing I’ve seen so far this year. Couldn’t stop watching it over the weekend.